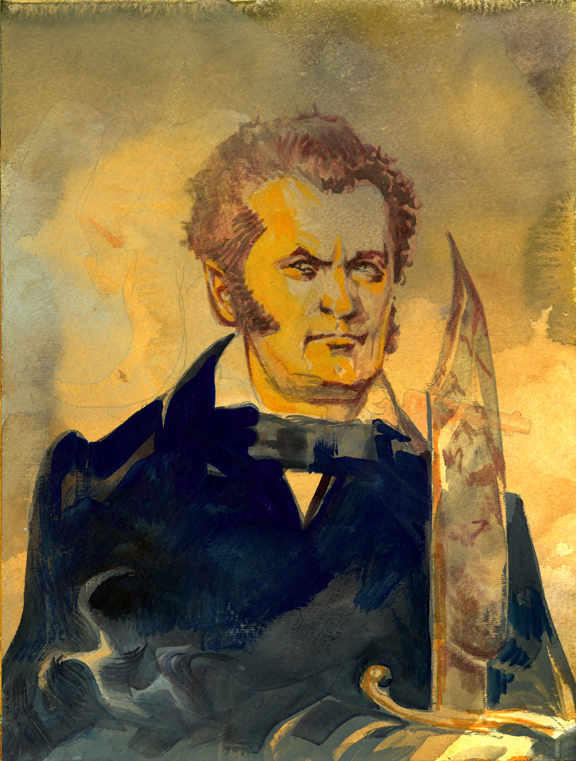 Bob Boze Bell's Big Bad Book of Bad Diary Entries: Was Jim Bowie Murdered? Or Did He Commit Suicide? 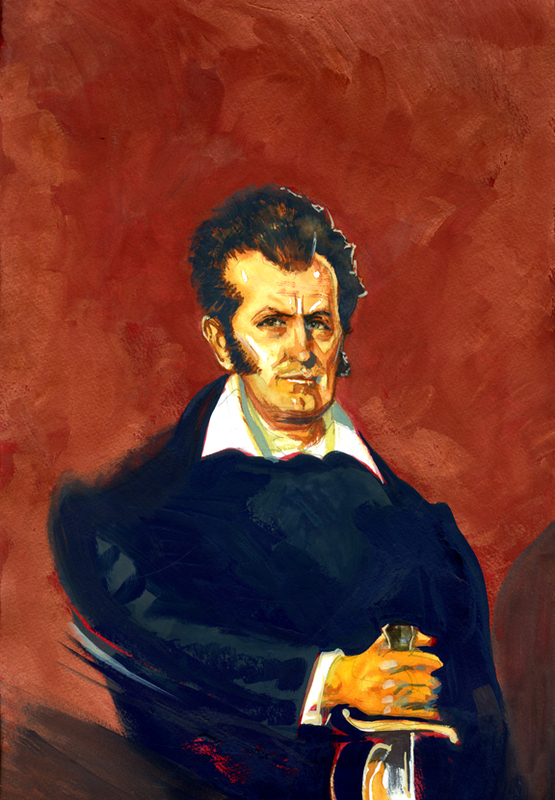 One of the most controversial aspects of the Alamo fight is what happened to the legendary Jim Bowie? He was, of course, the inventor of the most famous pig sticker in the history of the Republic, if not the world. Daily Whip Out: "Jim Bowie With His Pig Sticker"
Daily Whip Out: "Jim Bowie With His Big Tennessee Toothpick, No. 1"
Daily Whip Out: "Jim Bowie Cover Idea No. 7"
I really liked this concept, but my partner, Ken, thought I was being too cute with it, although I still have a hunch the Texas flag would grab some attention on the newsstand. Anyway, Ken wanted to see a more traditional portrait of the fighter. without all my flourishes and gimmicks. Daily Whip Out: "Jim Bowie Portrait No. 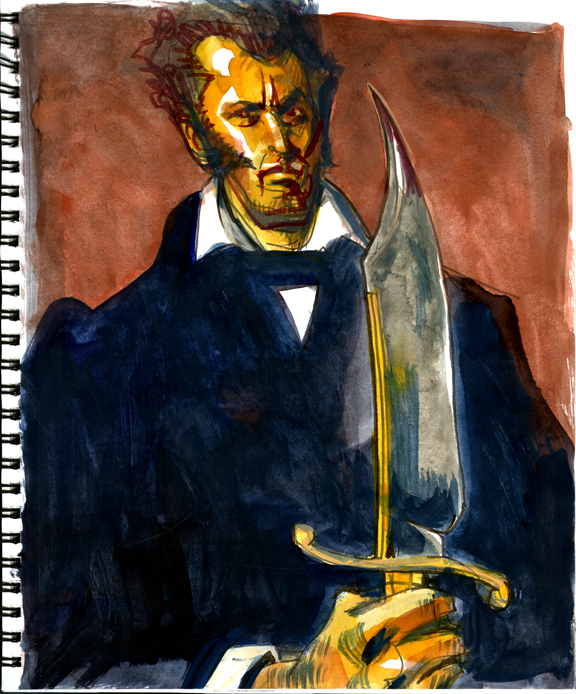 13"
Daily Whip Out: "Jim Bowie Brandishes Bowie Knife"
Unfortunately, I think the knife in the first sketch is the best. Dang it all to hell! We are doing a cover story on this for the next issue of True West. 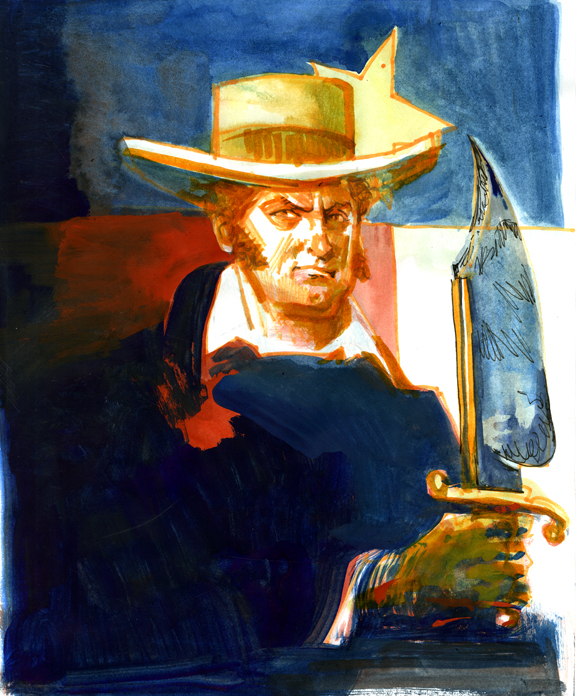 The preeminent historian and Alamo expert William Groneman III takes us through the lively debate as to whether the famed Alamo defender went down as a gallant hero, fighting to the death, or should history remember him dying as a sick and feeble coward? "Our friend Bowie, unable to get out of bed, shot himself as the soldiers approached it." Custer said to "save the last bullet for yourself." Bowie knew there was no quarter and the thought of a dozen bayonets to the belly certainly could have made a bullet to the brain pan sound like a better alternative. I kind of agree with Ken less knife and more Jim Bowie. Maybe knife horizontal below chest. On the other hand it's your Damn"whip out"
After a life like he had I do not see him backing down and taking the easy way out. The odds were high but he never ran from a fight. That is "Arkansas Toothpick"!!!! Not Tennessee. Made in Arkansas by a blacksmith named Black for Bowie. Yes, it is, in fact known as an Arkansas Toothpick, but I couldn't resist the alliteration. He wouldnt give them the satisfaction of killing him, since he knew no quarter was being given. 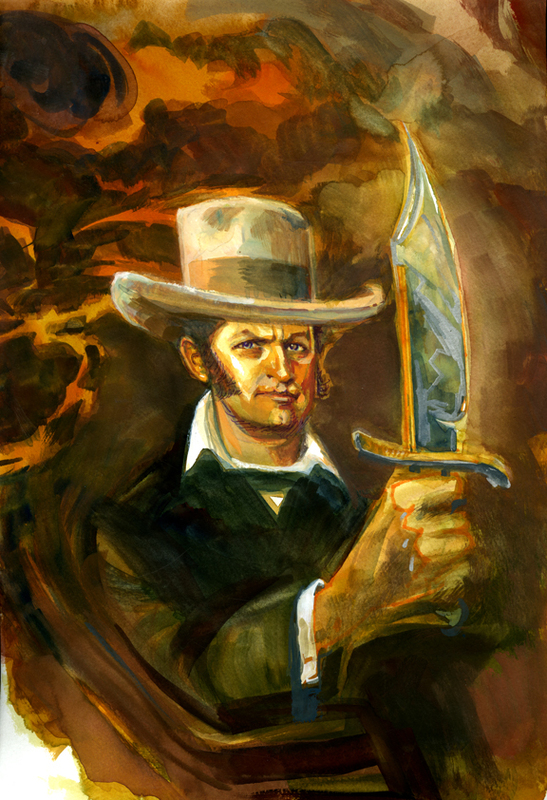 He might have been sick and feeble but Jim Bowie was no coward.